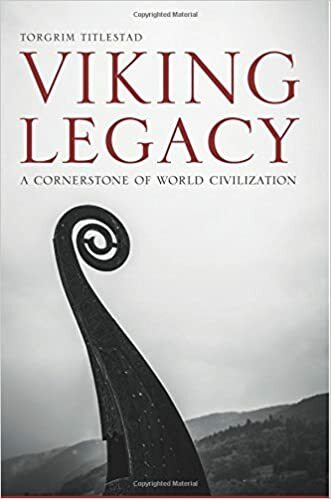 The publishers of Viking Legacy (which, in case I forgot to mention it, I translated), are pleased with the sales results of my article at The American Spectator Online yesterday (see below). So I thought I’d share a snippet of the book tonight. I chose this excerpt pretty much at random, except that I made a point of finding one concerning Erling Skjalgsson. This one deals with an aspect of Erling’s relationship with King Olaf Trygvesson that never occurred to me when I wrote The Year of the Warrior. It starts by discussing Olaf’s treaty with King Ethelred the Unready of England, entered into before he left for Norway. This treaty is documented (you can read it in the book), and it involves, among other things, a promise by Olaf to restrain Norwegian raiding in England. When Olav returned to Norway in 995, he lacked the necessary authority to convince the chieftains of western Norway to abandon their traditional plundering economy, based on raids in England. Plunder was an important source of income for the communities of western Norway. Only Erling Skjalgsson, as the foremost chieftain of the Gula Thing, had the power to enforce Olav’s agreement so far as the people of western Norway were concerned. Erling was thus the key to Olav’s hopes of maintaining a positive and enduring relationship with England. But Erling in his turn would have to make sure of the other chieftains’ support. It would have been no easy task for him to keep his followers on a leash in order to guarantee Olav’s English agreement. Breaking off the raids in England would deprive the great men of part of their economic and political base. For that reason Olav had to have some means of substantially compensating the people of western Norway if he was to persuade them to leave England in peace. He had procured the economic means to do this – among other things tons of silver, including what he had plundered himself. It is nearly impossible to estimate what Olav’s entire fortune would have been worth in today’s money, but we can assume that Olav Tryggvason in 996 was the richest man in Norway. Olav would have used these financial resources to woo the chieftains – while expounding the terms of his agreement with King Ethelred…. It was in Olav’s interest to avoid war with the inhabitants of western Norway. The terrain was difficult to control, with numberless fjords and mountains. Olav was effectively a foreigner in Norway. The people of western Norway would have been capable of setting a number of traps to defend their region, and it goes without saying that Erling’s willing cooperation was crucial to Olav. With Erling at his side as a loyal ally, the nation-building project would be much simpler than if he were a hostile or half-hearted vassal. He could hardly hope for a more influential collaborator. Prospects for trade with England may also have played a part in the debate. Nor could Olav have been stingy when it came to the question of his sister’s [Erling’s wife’s lw] dowry. Miserliness in this matter would have weakened his reputation as a trustworthy man, and so Astrid must have brought a tidy sum of English silver into the marriage. This would have increased Erling’s fortune, as well as his influence, considerably. Last month I did a lecture for the annual Viking Feast of our Viking group. This is it. About 36 minutes. Someone shared the video at this link on Facebook today. It’s “The Battle of Maldon, the Lego Version.” The creators went to the trouble of staging the story in Lego figures. They commit the sin of horns on Viking helmets, but let’s face it, you can’t be too scrupulous when you’re dealing in Legos. “The Battle of Maldon,” of course, is a famous Anglo-Saxon poem describing a battle between Englishmen and Norsemen in 991. The Norsemen won, due either to cheating by the Vikings or the stupidity of the English commander (depending on your point of view). By the way, it’s generally agreed that the Viking commander that day was Olaf Trygvesson, a major character in my novel The Year of the Warrior. Some years back I read historians saying they’d decided it wasn’t him after all, but now everybody’s saying it was. So I guess they changed their minds.